3.6 GPA . ACADEMIC INTEREST IN VETERINARY SCIENCE. MEMBER OF REACT, YOUTH LEADERSHIP SUBSTANCE ABUSE PREVENTION CLUB, SINCE 2013. MENTORS YOUNGER STUDENTS TWICE PER MONTH IN COMMUNITY SERVICE, DRUG PREVENTION AND STUDENT LEADERSHIP IN CLINTON SINCE 2017. VOLUNTEERS AS AN ASSISTANT AT THE THERAPEUTIC RIDING PROGRAM SINCE 2016. VARSITY STARTER (2B / OF / 3B) FOR THE MORGAN SCHOOL, CLINTON AS A FRESHMAN. THE BUZZ: COLLEEN IS A TREMENDOUSLY AGGRESSIVE AND INTELLIGENT PLAYER. SHE HAS A NATURAL AGGRESSIVENESS ON THE FIELD THAT CAN’T BE TAUGHT. 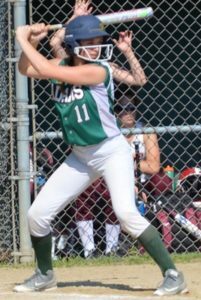 SHE WILL BE BEGINNING HER FIRST YEAR AT 16U, AND WILL CONTINUE TO BE A FORCE ON HER HIGH SCHOOL TEAM AND IN THE SHORELINE CONFERENCE. OFFENSIVELY, SHE SWINGS THE BAT WITH GAP POWER AND ALWAYS HAS THE ABILITY TO TAKE THE EXTRA BASE. SHE IS A LEGITIMATE THREAT TO STEAL ANY BASE. 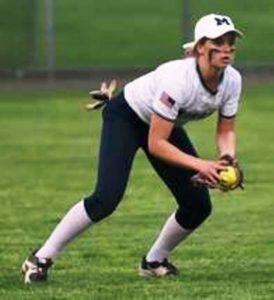 COLLEEN HAS CONSIDERABLE SKILL IN THE OUTFIELD AND AT THE CORNER INFIELD. SHE HAS A VERY STRONG ARM WITH A ROCKET RELEASE. THE SKY’S THE LIMIT FOR HER OVERALL DEVELOPMENT IN THE NEXT FEW YEARS.